Rid your roof of the damaging bacteria (called Gloeocapsa Magma) that feed on your roof’s shingles and cause those ugly black streaks. License to Wash offers professional roof cleaning in Ocala FL. By combining the latest non-pressure roof cleaning technology and quality, specialized cleaning solutions, we can gently remove algae, dirt, bird droppings, and other pollutants while helping protect and extend the life of your roof. No matter what type of roof you have – asphalt shingle, tile, cedar shake, or other – we can remove the black streaks. At License to Wash, we use only soft washing processes rather than high pressure water, which can blast away granules or shingles, damaging your roof. Protecting your roof is our top priority. Roof streak removal is one of our specialties. If you’re looking for roof cleaning near Ocala FL, give us a call today! Your roof will be cleaned using a detergent based process and absolutely no pressure. Same day results are sure to please and may even make the neighbors jealous. Our process is environmentally friendly and kind to the pets and landscaping as well. 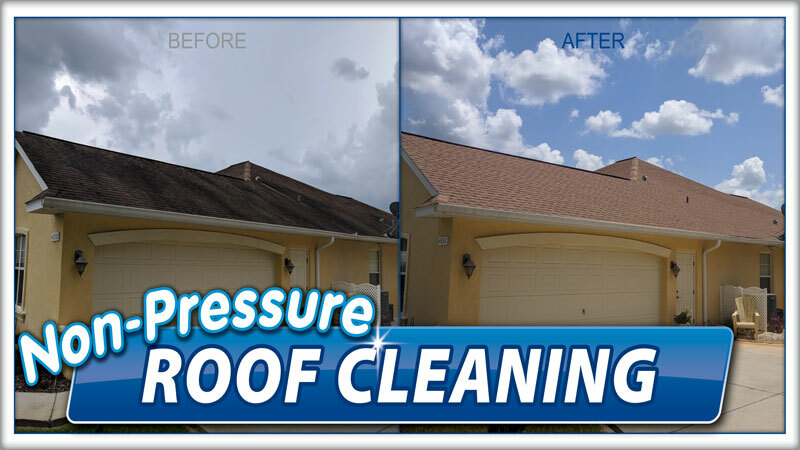 Non-Pressure detergent based roof cleaning is covered by our 100% satisfaction guarantee.